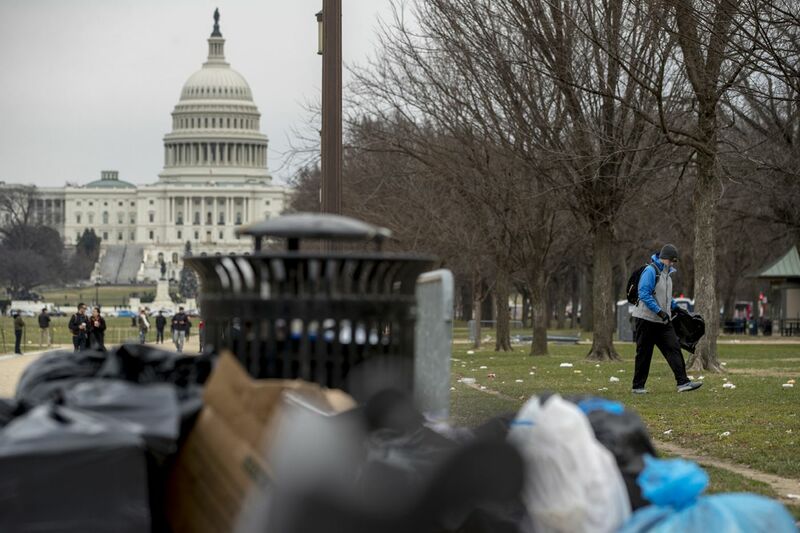 Garbage piles up on the National Mall in front of the Capitol building as the partial government shutdown approaches its third week. The effects of the partial government shutdown are widening as the impasse over President Donald Trump’s request for $5 billion for the construction of a wall along the U.S.-Mexico border grinds through its third week with no signs of abating. Nine federal agencies have been forced to close due to the shutdown, which began Dec. 22: the departments of the Treasury, Agriculture, Homeland Security, Interior, State, Housing and Urban Development, Transportation, Commerce, and Justice. Across the country, the shutdown is making its impact felt. Here’s what’s happening now — and what could happen if the impasse continues. Garbage and human waste have begun to pile up at national parks, many of which have been left open to visitors despite staff furloughs. The Smithsonian announced on Jan. 2 that the National Zoo and its 19 museums were closed to the public. A private security officer tells Loren Brandman of Fairfax, Va., how to see the Liberty Bell in Philadelphia from outside during the shutdown. Immigration Court in Philadelphia is shuttered, accepting only emergency filings for people who are already in detention. That mirrors what’s occurring in most of the rest of the country, where courts closed Dec. 26, available only for emergency requests. All other docketed cases will be rescheduled once funding resumes. Most operations at U.S. Citizenship and Immigration Services, which administers the nation’s legal immigration system, continue to function. All USCIS offices are open, and people should attend their scheduled interviews and appointments. The shutdown does not impact the fee-for-service activities performed by USCIS. The process by which labels are approved for the sale of new beer, wine, and distilled spirits has come to a stop. No new applications have been reviewed for weeks, leaving thousands of manufacturers around the country in a holding pattern when it comes to new releases. The Alcohol and Tobacco Tax and Trade Bureau, part of the U.S. Treasury Department, is tasked with approving labels for wine, beer, and spirits before they hit store shelves, ensuring they carry required information such as the alcohol content by volume. The Food and Drug Administration is continuing its “core functions,” such as monitoring for outbreaks, supporting food and medical recalls, and pursuing criminal and civil investigations, according to a shutdown contingency plan from the Department of Health and Human Services. The Environmental Protection Agency has 13,972 full- and part-time employees, most of whom were furloughed from duties at 134 facilities on Dec. 29. Many are scientists and engineers. About 800 employees have been deemed essential to carry out various duties. The furlough means it will be difficult for citizens to get information about pressing environmental issues. The EPA warned that its websites were not being updated, except in the event of an environmental emergency. The portion of the Internal Revenue Service that focuses on income validation for new mortgages was not deemed an essential function, said Pete Mills, senior vice president of residential policy at the Mortgage Bankers Association. That means home buyers who need income verification when seeking mortgages could see a delay — particularly gig-economy workers who do not receive regular income documentation. Mortgage lenders typically attempt to validate a borrower’s income and tax returns “in an abundance of caution” before funding a loan, Mills said. More complicated borrowers could have their home purchases put on hold — adding delays to the entire housing market. A for-sale sign goes up in Narberth. Some mortgage seekers could face delays due to the partial government shutdown. So far, the region’s federal courts have continued to operate largely as normal by dipping into court fees and other sources not dependent upon congressional appropriations. However, officials at the Administrative Office of the U.S. Courts expect those funds to become severely depleted should the shutdown extend beyond Jan. 11. The federal courts would not close entirely if that deadline is breached, but significant curtailment of operations would occur and funding for jurors, some probation supervision, court reporters, and public defenders could be in jeopardy. Food stamps (known as the Supplemental Nutrition Assistance Program) will continue through the end of January, according to the U.S. Department of Agriculture, which did not receive its appropriations. Local advocates believe that people will be covered even if the partial shutdown lasts into February and beyond because of the program’s importance. While the thinly staffed Internal Revenue Service earlier said it couldn’t issue any refunds during the shutdown, the White House now says the agency can refund taxpayers even if the impasse persists into filing season. But it’s not clear how the agency will issue refunds without staff to process returns. And as tax season begins to roll around, the IRS is not currently responding to taxpayer questions. Also, the IRS has not announced an official start date for the 2019 filing season. Typically, the start of the tax filing season is in mid-to-late January. Workers at shelters that serve vulnerable populations and rely on federal funding are starting to worry. Domestic violence agencies in the Philadelphia region say their biggest concern is the uncertainty that comes with not knowing when payments might come. The U.S. Department of Housing and Urban Development is closed, according to its website. A 90-page contingency plan is in place. At Philadelphia International Airport, 73 air traffic controllers and seven traffic management coordinators are working as essential employees, according to Christopher Perks, local president of the National Air Traffic Controllers Association at Philadelphia International. Meanwhile, four employees in the control tower were furloughed. These FAA staff specialists handle quality control, take care of training requirements, and plan for special operations, whether they involve the military or a fireworks display. Even though those workers were deemed “nonessential,” Perks said their job is “crucial” to allowing air traffic controllers to focus on the job of moving airplanes. “We’ll always be safe, but efficiency is what is degraded,” he said. A spokesperson at PHL said the airport has not been affected by the government shutdown. During a news conference in Pittsburgh with labor leaders, Pennsylvania Auditor General Eugene DePasquale said he was concerned how the shutdown would affect the national economy and the stock market — and therefore the state’s pension funds. Blank Social Security checks processed in Philadelphia. The Social Security Administration was fully funded in September, so checks won't be affected. The budget brawl won’t affect Social Security benefits because the Social Security Administration received its full funding for fiscal year 2019 in September, the agency said. The U.S. Labor Department, which includes the Office of Unemployment Insurance, isn’t affected by the government shutdown because it has funding in place through September. The federal cash welfare program known as TANF (Temporary Aid to Needy Families) is under the aegis of the U.S. Department of Health and Human Services, which has gotten its appropriations and is not shut down, according to Seth Hanlon, senior fellow with the Center for American Progress in Washington. Similarly, the Child Care Development Fund is also part of HHS, and will not be affected by the partial shutdown. Institutions around Independence National Historical Park are feeling the impact of the shutdown, and visitors to the area are often “confused” about what is open and what is not, according to tourism officials and those working at sites in the area. Alex McKechnie, spokesperson for the Museum of the American Revolution, a private nonprofit that does not rely on federal funding, said there has been a “noticeable increase” in the number of telephone calls asking if the museum, at Third and Chestnut Streets. is open. (It is.) But there’s been a down tick in museum attendance since the beginning of the shutdown, she said.